Extracts of the plant turmeric—the spice that gives Indian curries a yellow color—have been used as an anti-inflammatory treatment in traditional Asian medicine for centuries. Clinical trials of curcumin (the active chemical compound in turmeric), however, have produced mixed results. A molecular understanding of curcumin's biological effects is needed. Claus Schneider, Ph.D., and colleagues have now discovered that curcumin is a "pro-drug" that is converted into reactive metabolites with anti-inflammatory activities. The metabolites of curcumin, produced by oxidation reactions, covalently bind to and inhibit proteins in the inflammatory NF-kappa-B signaling pathway. 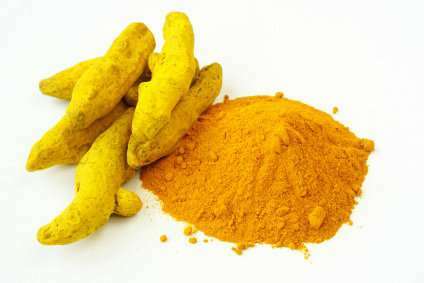 The researchers found that curcumin undergoes oxidation reactions readily in vitro. They suggest that insufficient bioactivation in vivo may explain the mixed results in human studies of curcumin activity. The findings, reported in the Journal of Biological Chemistry, suggest that metabolic bioactivation should be considered in clinical trials of curcumin and other dietary polyphenols of medicinal interest, such as resveratrol (red wine), quercetin (onions) and epigallocatechin gallate (green tea).